Designed by a tool maker and John Deere hobbyist, this tool is a must for every John Deere owner as described below. It is very effective, inexpensive and can be used again and again. This listing is the original rivet tool set designed and built by Sunsdahls' Restoration Tooling. Included is one pulley brake riveting punch for all two-cylinders, one wheel brake riveting tool for two-cylinder and New Generation John Deere tractors, and a rivet tool alignment frame press. Rivet alignment frame is custom made for our pulley brake rivet setter and our wheel brake rivet setter. The rivet frame is made of steel and has clearance for any brake shoe. The throat is 3 1/2. It is held in a vise and shown with our rivet setters. The pulley brake riveting punch is made of high quality alloy steel and used for rivets with 9/64 diameter. 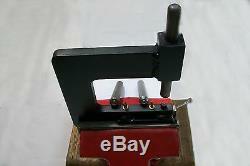 The wheel brake riveting punch is high quality heat-treated steel and used for rivets with 3/16 diameter. Riveting directions and tips included. The item "John Deere Pulley Brake Wheel Brake Rivet Tool Punch Alignment Frame Set" is in sale since Sunday, January 20, 2019. This item is in the category "Business & Industrial\Heavy Equipment, Parts & Attachments\Heavy Equipment Parts & Accessories\Antique & Vintage Equipment Parts". The seller is "tools4deeres" and is located in Faribault, Minnesota. This item can be shipped to North, South, or Latin America, all countries in Europe, Australia.